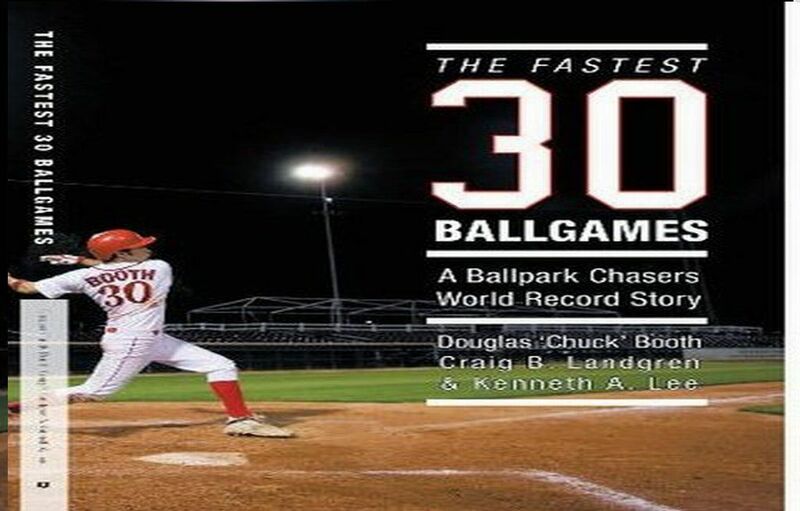 Douglas ‘Chuck’ Booth (Baseball Writer)- I am sure all of us know how grinding it is to make a baseball game in terms of traffic. Well add to that problem with unfamiliarity of the area and this can be a stressful time. I learned some valuable lessons in my 30 park trips. Some of the expertise I crafted came from deep research. If you are traveling with 1-3 people, you are better off trying to find yourself on public transportation. In most cases, price and time wise, taking public transportation is effective. You just have to know what you are dealing with. I will break down all 30 MLB Cities-with quick hints and suggestions. NYY- Subway is a great method of travel in New York. Not only does it cost a pile to rent a car, it is the time and gas spending in exhausting traffic, plus in ‘NYC’ there are many tolls along the way. 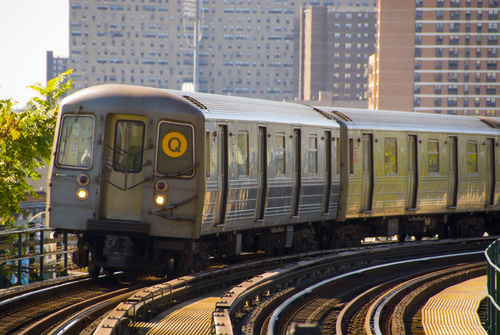 You can take a city bus from LGA to the subway stations for better travel. JFK has a Subway Platform at the end of their Airports Tram Line. Newark Airport is not as bad as NYC Airports, however it is much further for transportation into New York. There is an Amtrak Station at EWR that has very cheap fares into New York Penn Station. It is a quick commute. BOS- They have the T-Train to commute with in the city. I have honestly never taken this service but others swear by it. There are some cheap parking alternatives on Common Wealth Ave near Fenway. Keep in mind that traffic is abysmal outside of Fenway after games. TB- Since the ‘Trop’ is actually in St. Petersburg, you really should rent a car. The only viable option is if you are coming from Miami on Greyhound. The Greyhound Station in St. Pete is about a mile from the ballpark. The staff at the station will even store your luggage for a nominal fee. TOR- I would not advise on public transit from Lester B Pearson Airport. If you come in via Greyhound or Amtrak, you are already in walking distance in Toronto’s down town core. If you are staying in downtown Toronto, you really don’t need a car. One option I used before is the Downtown Shuttle from the airport, that takes you down to the York Hotel, which is a few blocks from the Rogers Centre. They run for most hours of the day. Last time I went it was a $28 round-trip. BAL- Awesome to use light rail service in this town-this is the way to go. Coming from the Airport is easy. The light rail station takes you right near Camden Yards. If you are staying at a hotel near the Airport, why not just take light rail back to the Airport and then catch your given hotel’s shuttle car? This way you receive great service to the hotel and don’t have to walk as much. DET- I would not advise on taking public transport in Detroit. The park, while fantastic, is not in the greatest area of town once you venture away from the park. Cruising around by car is not bad in the Big ‘D.’ The Metro Airport is a far distance from the park which makes it smarter to rent a car anyway. CWS- Perhaps the best public transportation lies within the city of Chicago. The Red Line Train takes you to either Us Cellular Field or Wrigley Field. The Blue Line Train takes you all the way downtown from O’Hare Airport. 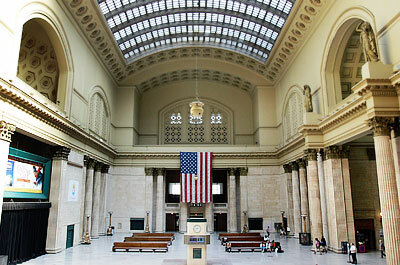 Chicago Union station is perfectly situated between the two parks for people arriving by Amtrak or Greyhound. Traffic is insanely bad on Highway 90/94 or 55. Plus if you drive in this city, make sure you carry about $10 worth of change for all of the tolls you encounter (from 80 cents to $4.00). MIN- Minnesota is another ball city where the Light Rail Transportation rocks. I am calling this my favorite subway system. There is a platform right in the MSP Airport. One way goes downtown towards Target Field. The Other way goes to the ‘Mall of America.’ This is a superb way to get around, even if you have to drive into Minnesota from another city, park anywhere along the way and take this transportation in. CLE- Cleveland has an underrated transportation system. Much like Chicago, they have a light rail station right at Hopkins Airport. You simply ride the train into ‘Tower City Square Station,’ which is right down town. If you are staying down in the area everything worth-while is within walking distance. Public buses can take you the rest of the way if need be. KC- Kansas City is just one of those cities where you need a car. The park is over 30 miles from the Airport. The only other effective option is to use Sedan Service. For a round-trip(pre-booked), it will only cost you about $110. If you are going to other spots at the park then it is not worth this service, however if your hotel is near the airport, than this is a good and cozy way of travel. Using a car in KC will cost you about that much anyway. SEA- The light rail transportation has steadfastly improved in the last few years. There is even a train that runs right from SeaTac Airport all the way to Safeco Field. If you are staying downtown this is a viable option. Other than peak hours on the Highway 5, the drive around the yard is not bad at all. OAK- When staying in Oakland, this is all depends on you. The airport is not far from the Coliseum, we are talking 3 miles. You can easily take a cab for cheap. The area of Oakland is a pretty scary one though. If you are just there for a day game you do not need a car. The ‘BART’ Train Station outside the park gets you over the bridge and into ‘nicer’ San Francisco for about $8-12. LAA- Public transportation is very good in Orange County. There are so many hotels near the ballpark that you could find yourself walking. If not, take the bus, as it is very economical and Los Angeles has a nice scenic commute. TEX- I would advise against public transportation in the city of Dallas/Arlington. The ballpark is far from the airport, plus there is a lot of real estate between this complex and the rest of society. You must remember that Six Flags is right across the street, along with Cowboys Stadium. Drive in this city!! SF- you do not need the aggravation of driving a car in SF. It is expensive, traffic filled, hilly and worst off is that it is darn expensive for car rental rates. 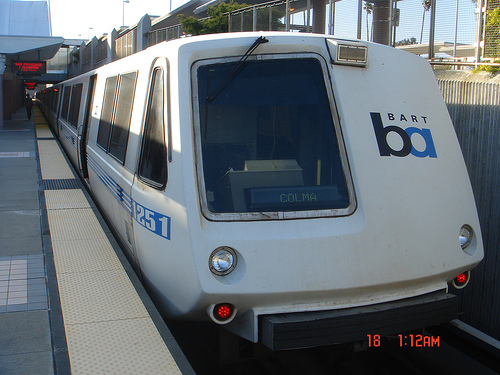 The ‘BART’ train can take you from ‘SFO’ Airport all the way to where you need to be. 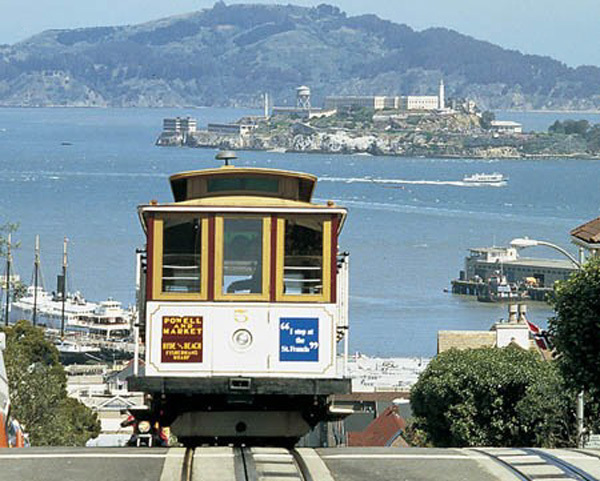 After this, what better way to travel than: Historical trolley, or at least the scenic route of all the piers via Light Rail Transit.? There are several city bus routes to take you anywhere. If you have an early morning flight, check with your hotels, there are also plenty of shuttle buses that can take you back to SFO at any time of day or night for about $15. COL- Much like KC, the airport is just too far from any civilization to use public transport. Rent a car. The prices for parking in Denver are quite reasonable anywhere. ARI- You are better off taking Light Rail into the fine city of Phoenix than renting a car. The car rental “Transportation Center” is 4 miles from the airport in the wrong direction. The city is also only 4 miles away. If you are staying in downtown Phoenix, you can go anywhere via public transport. All of the subways/buses have Air Conditioning too. LAD- Los Angeles is the worst public transportation city in the Majors. You add the uniqueness of Dodger Stadium in the middle of nowhere, then you shouldn’t want to do anything else but rent a car to travel. You can take a 2 hour bus from Disneyland, to continue on with a 4 mile walk to the park if you are adventurous. The last bus back to Disneyland is around 9 PM though. If you have to take public transit, attend a day game. SD- San Diego’s Bus/Subway system is good. If you are staying within the confines of the city, you will have no problem using the light rail train service or public buses. If you are outside of this zone, plus renting a car, park your car at the ‘Old Town Station’ and take light rail into Petco Park. HOU- Don’t fight what wisdom tells you, always rent a car in Texas. The ballpark and city are too far from the airport. Again with escalating temperatures, keep yourself cool in an air-conditioned environment. PIT- This one I am torn on a little. 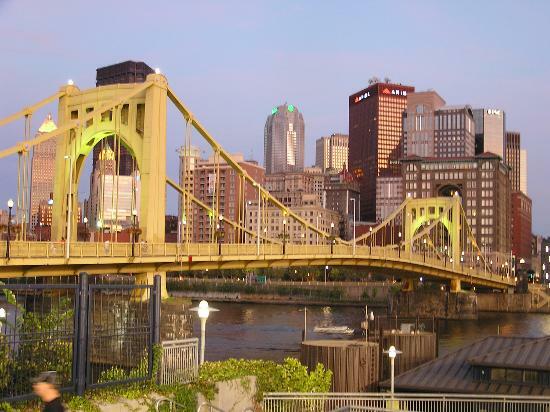 The 28X Pittsburgh bus from the airport takes you right downtown. This beautiful little city is easy to walk around back and forth between the yellow bridges. The tough part is leaving the area requires deep transportation. I personally always rent a car because the prices are good. You also have the car transportation center directly adjacent to the airport. This is rare. STL- Unless you are staying at hotel within walking distance of Busch Stadium, just rent a car and be okay with it. If you have to use unable to rent a car, there are shuttle buses that you can sneak on for $16 a person, (use the Hilton Hotel as it is the closest to the park) I have never used public transport in this city but will on my trip this year. CIN- With a heavy smog alert every year in the summer, plus a far distance from the Airport, this is yet another city to rent a car. Chances are, you will not have flown into CVG with it being one of the most expensive cities to fly into. Cincinnati is a great city to drive around. MIL- The public transportation is just fine in this city. I must say this though, Milwaukee is the best city in the USA for value when it comes to renting a car. Not only that, the transportation center is directly across from the airport. Parking is cheap everywhere and navigational driving is made easy by the main roads. NYM- Subway is a great method of travel in New York. Not only does it cost a pile to rent a car. It is timely to spend time in exhausting traffic, plus there are many tolls along the way in NYC. You can take a city bus from LGA to the subway stations. JFK has does have a Subway Platform at the end of the Airport. Newark is not as bad as NYC however it is much further to take transportation. There is an Amtrak Station at EWR that has very cheap and fast fares into New York Penn Station. For Citi Field, the 7 train line is ideal. For night games, just be wary of service. If you think you can find a taxicab for under $40 you are mistaken. The cab drivers don’t care that you are only going a few miles, they like to charge you top $$. ATL- I dislike all of the travel methods in Atlanta. The buses are unreliable, but worst off is how far the car rental companies are from the airport. Still it is better to rent a car in this city. I would rent with National/Alamo before any other car rental company as the employees are outstanding!! MIA- Whether you fly into FLL or MIA, renting a car is your best option here. There is just too much land to cover with trying your luck with public transportation. You add in the weather changing every 5 minutes, settle with the known here. PHI- This is all depending what you are doing, but driving is not that bad in Philadelphia. Parking is reasonable at the Sports Complex too. You are only a few miles from Philly Airport. I would tend to go with a rental car. If you plan on visiting New York, Baltimore or Washington I would suggest parking the car at PHL-30th station while you go to other cities. You are going to pay through the roof on Highway Tolls if you drive in the North Eastern Region. Amtrak will also get you there so much faster. WSH-I have done lots of research about public transport in Washington, but never actually used it. DCA Airport is close to Nats Park. If you are sight –seeing, you really don’t need a car. The Metro is a pretty good system. Once you are downtown, everything is within walking distance. An alternative here would be to rent bicycles. There are beautiful trails to discover in this city. Posted on February 24, 2012, in The Rest: Everything Baseball and tagged Amtrak, car rental, chicago, Chuck Booth, citi field, Greyhound, Los Angeles, Mall of America, Metra, National Car Rental, new York, subways, travel. Bookmark the permalink. Comments Off on Public Transit is A Cheap Method of Travel to MLB Parks.